The Papers of Thomas Jefferson, established at Princeton University, is preparing the definitive scholarly edition of the correspondence and papers written by America's author of the Declaration of Independence and third president. Since the publication of Volume 1 by Princeton University Press in 1950, the project has been publishing, in chronological sequence, not only the letters Jefferson wrote but also those he received. As the first modern historical documentary edition, the project initially assembled photocopies of every known extant letter or Jefferson-related paper, approximately 70,000 items gathered from 900 repositories and private collections worldwide. Neither an archive of original manuscript materials nor a collection of digital facsimile images, the Jefferson Papers is a collaborative publishing hub providing in print—and now in electronic format—quality, contextualized Jefferson source material for posterity. With each new document transcribed, annotated, and edited to exacting standards, the Papers has provided an unparalleled, accessible source of the written legacy of Jefferson. 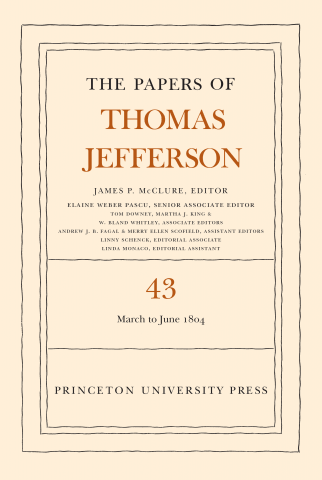 The edition is comprehensive in scope, with the Princeton editors bearing the responsibility for the letters and papers during the period from 1760 through the end of Jefferson’s presidency on March 3, 1809. Our colleagues at the Thomas Jefferson Foundation at Monticello are producing the volumes that cover his retirement from public life until his death in 1826.